Husband lost all kidney function within a week after an AGN attack on kidneys. Zero urine output. Currently has chest catheter and going to center 3 x week. At home dialysis class today a joke. Learned more from you tube. However nurse did say with zero urine output PD could be 12 hours a night plus 1-2 exchanges during the day. We live literally 5 minutes from clinic. HD at home not really an option. We have two dogs and a cat. He is 73 has MS and stage 1 bladder cancer. Legs now starting not work so mobility issues and starting to have dexterity issues in fingers. I’m leaning towards fistula and going to clinic 3-4 times a week. We have high school aged twins that play sports so have night activities at least twice a week. Also, with the chest catheter the doctor is saying he can’t get blood clean enough and will be putting him 4 hrs in chair until the surgery for life time choice made. He is retired so work not an issue. I just feel if he is stage 5 with no urine output his home time will be crazy like 12-14 hours. I can’t get anyone to to give me an example of other patients with no urine output and the amount of time their home prescription is. How do we make an educated guess if we can’t get educated. Thank you so much! Esqslave, I can’t even imagine what a shock all of this has been for you and your husband. Losing all of his kidney function in a week?! I am so sorry. 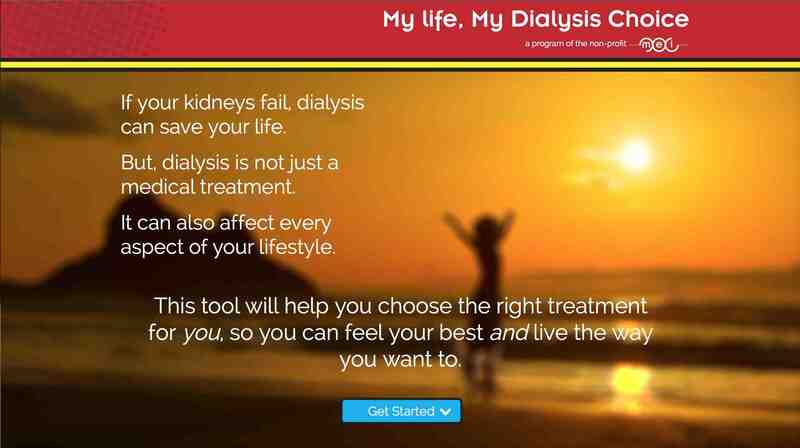 This site is HOME Dialysis Central–because we passionately believe that home treatments are better for quality–and LENGTH–of life. The research backs this up. The clinic may be 5 minutes away, but the treatment itself tends to be harsh and grueling, with multiple hours of recovery time needed after each one (longer recovery time is linked with shorter survival). Done gently, people can do quite well on in-center HD. I personally know a couple of them who have lived for 30+ years doing it. One is even still working. But, that’s rare. VERY rare in the U.S., mainly because clinics tend to insist on removing a lot of water in a short time, which “stuns” the organs by depriving them of oxygen-carrying blood. With no kidney function at all, if he can stick to a rigid fluid limit, this may be less true–people who still do have some function tend to do the worst. Having a dog and a cat does not rule out PD or home HD. It sounds as if whatever treatment he does, his dexterity issues mean that you would need to be involved in a lot of the care. PD is easier to learn and do than HD. It makes a good first treatment, but tends not to last more than 2-3 years, after which a transplant or switch to HD is needed. PD is gentle, and if he is not a large man, even without any urine output, he may not need to be connected to a cycler for 14 hours. Really, anything more than 9 or 10 hours may reflect poor prescribing. It’s often better to increase the fill amount or add daytime exchanges rather than tether someone for 14 hours. Here is a link to an article an internationally known nephrologist wrote about prescribing PD that may help you and your husband’s doctor: https://www.homedialysis.org/life-at-home/articles/tailoring-automated-pd-to-your-life. HD is much more efficient, and, done at home at night during sleep, would interfere the least with your active lifestyle and give him the best chance to feel well and live longer. If you haven’t seen our free, online treatment matcher, you may find it useful for seeing what life might look like with each type of treatment. https://www.mydialysischoice.org. I found a Medscape article on acute glomerulonephritis (AGN) that is lengthy but might give you ideas of questions to ask. According to the article, most cases of AGN result from a type of strep infection (upper respiratory or skin) and occur 1-3 weeks after the infection. Other bacteria, viruses, parasites, or fungi can cause AGN too as can other non-infectious diseases. Has the doctor investigated the cause of the AGN? Here’s the link to an article on AGN. You have to subscribe to Medscape, but the subscription is free and it’s a great resource for medical info. The article says depending on the cause, it’s possible to recover from AGN, but AGN can become chronic and lead to permanent kidney failure. Hello! Not sure if you’re still looking for input on this topic. This is also my first post on these forums, but I stumbled upon this thread and have some info. My husband went from not knowing of any kidney disease to ESRD in May 2014. Started with in-clinic hemo via CVC before transitioning to PD in Aug 2014. Though he initially had some urine output, it disappeared within about 6 months (IIRC). His time on the cycler overnight started at 8 hours, then 9, then 10. He was always doing one manual exchange in the evening, after returning from work (full-time). Numbers weren’t great, so his neph added extraneal fluid (cycler put it in after last drain) to dwell all day until the manual exchange. I imagine your husband would not be on the machine for more then 10 hours/night. Manual exchange takes about 45 min, including setup/cleanup. Hope that helps! Of note, my husband’s numbers were always just adequate on PD. He also slept terribly and suffered moderate back pain daily. He is currently in training for home hemo, and we’re hoping for better outcomes. Now he just needs to get used to the needles. Thank you for sharing your husband’s experience. Sometimes PD doesn’t provide the amount of toxin and fluid removal needed for a patient feel his/her best. In that case, a switch to home hemodialysis can give the patient better dialysis, an improved sense of wellness, while maintaining the sense of control over their treatment that people are often looking for with home dialysis.